The statistic presents the value of peer to peer lending worldwide from 2012 to 2014 and a forecast thereof for 2015 and 2025. 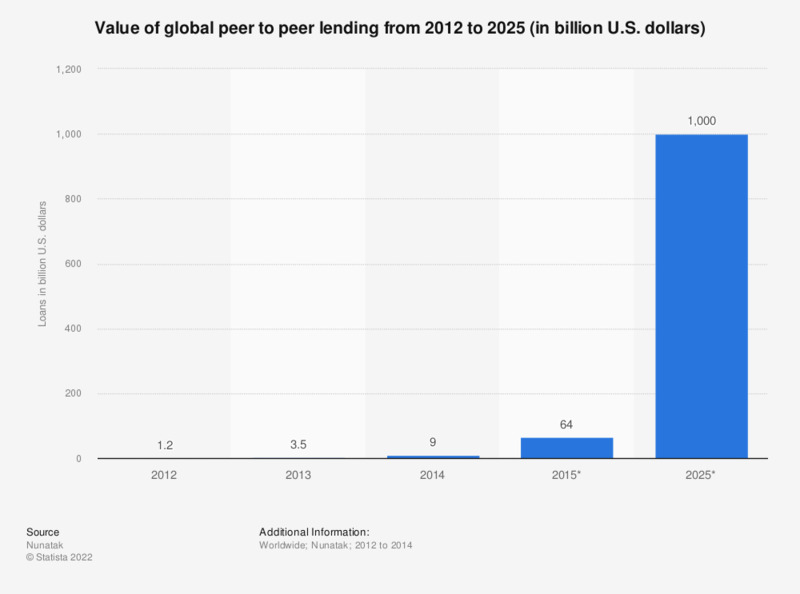 The global P2P lending market was valued at 3.5 billion U.S. dollars in 2013. Peer-to-peer (P2P) lending is a new type of “sharing economy”. P2P lending platforms help connect investors with borrowers without the bank acting as an intermediary. Between 2014 and 2015 the value of global P2P lending was expected to rise to a value seven times what it was in 2014 – from 9 billion to 64 billion U.S. dollars. By 2050 the value is expected to be close to one trillion U.S. dollars. In the United States, 26 percent of people admitted that they used peer-to-peer payments. The value of mobile P2P payments in the U.S. amounted to around nine billion U.S. dollars in 2014 and it was predicted to increase to 86 billion U.S. dollars in 2018. Also, the number of mobile peer-to-peer payment users in the United States was predicted to increase significantly – from 53 million in 2014 to 126 million in 2020. How much in total have you lent via this peer-to-peer lending platform? What did you raise money through peer-to-peer consumer lending for? How important are the following when making decisions about investing through a P2P (consumer lending) platform rather than investing your money elsewhere? How important were these factors in your decision to choose P2P consumer lending?